This book provides an incisive new look at the inner workings of the House of Representatives in the post-World War II era. 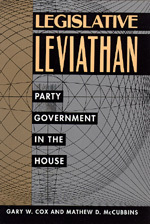 Reevaluating the role of parties and committees, Gary Cox and Mathew McCubbins view parties in the House—especially majority parties—as a species of "legislative cartel." These cartels usurp the power, theoretically resident in the House, to make rules governing the structure and process of legislation. Possession of this rule-making power leads to two main consequences. First, the legislative process in general, and the committee system in particular, is stacked in favor of majority party interests. Second, because the majority party has all the structural advantages, the key players in most legislative deals are members of that party and the majority party's central agreements are facilitated by cartel rules and policed by the cartel's leadership. Debunking prevailing arguments about the weakening of congressional parties, Cox and McCubbins powerfully illuminate the ways in which parties exercise considerable discretion in organizing the House to carry out its work. This work will have an important impact on the study of American politics, and will greatly interest students of Congress, the presidency, and the political party system. Gary W. Cox and Mathew D. McCubbins are both Professors of Political Science at the University of California, San Diego.